Publisher: Cosmos Editions, Republic of Korea. Cosmos Information by Yann Vincent (in the new transcription). 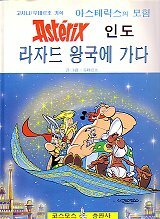 He adds "Cosmos only issued two titles of Asterix in Korea, even if all the titles are written on the back cover." 기원전 50년경, 로마군이 갈리이(골:현 프랑스인의 조상) 족들을 지배하고 있었을 때였습니다. ... 그때 정말로 모든 갈리아족들이 로마군에 항복한 걸까요? 아님니다! 용감한 갈리아 족이 살고있는 한 마을만은 침략자 로마군에 항하여 줄기차게 그저항을 멈주지 않았습니다. 그래서 바바오룸, 아꽈리움, 로다눔, 그고 쁘띠보눔... 이곳 마을 주변에 주둔하고 있는 로마군 주둔부대의 병사들은 끊임없이 갈리아족족으로 부터 괴롭힘을 당했습니다. Publisher: Moonhak-kwa-Jisung-Sa, Republic of Korea.